Clean Up Shred Up Time! If you have piles of bills or paperwork at home that you no longer need, this is something that you need. A shredding event! Shredding your documents protect you from identity theft and from fraudulent access to your account or personal information. However, paper can pile up really fast and before you know it, you have sacks of paper in your closet, garage and wherever else in the house. 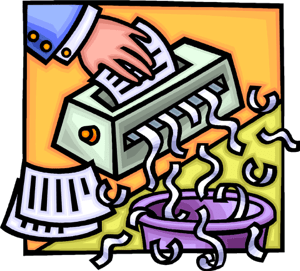 While it is true that buying a shredder is a good option, shredding a few sheets of paper at a time can get tiresome too. So, the answer to your problem is a shredding event and there are a number of those in Chicago for the remainder of September 2016! So, what are you waiting for? Gather up those boxes of paper and head on the free shredding location nearest you and “un-clutter” your home! Make the most out of what are for FREE in Chicago! Posted on September 22, 2016 by achicagohousewifeyPosted in It's FREE!Tagged chicago housewifey, everything free, free, free in chicago, free shredding. Hi, nice post. Paper shredder can also be used for shredding strips of colourful paper used for quilling paper. and so can use slippery, shiny paper from magazines that might also be cluttering to use for quilling. It’s a very interesting and innovative hobby to refresh the mind and making artistic things and gifts.